Movavi Video Converter is a video converter that will let you convert videos from one format to another. As you’re probably aware there are lots of video formats out there and different devices and platforms are compatible with different formats – so having a way to switch your videos between formats can be helpful. How Movavi Video Converter Works? Everything about Movavi Video Converter is designed to make it simple, straightforward, and easy to use – so learning how it works isn’t difficult. To convert a video to a different format all you need to do is: Add the video, choose the format, and click ‘Convert’. Instead of choosing a format you could select one of the hundreds of presets for different devices and platforms to optimize it for them. When you convert videos between formats, Movavi Video Converter will let you adjust the video settings and parameter as well. In particular you could resize the video through several methods, set the resolution, or adjust the framerate. On top of that you will also be able to adjust the video bitrate, or set the output file size to a particular value to compress the video. 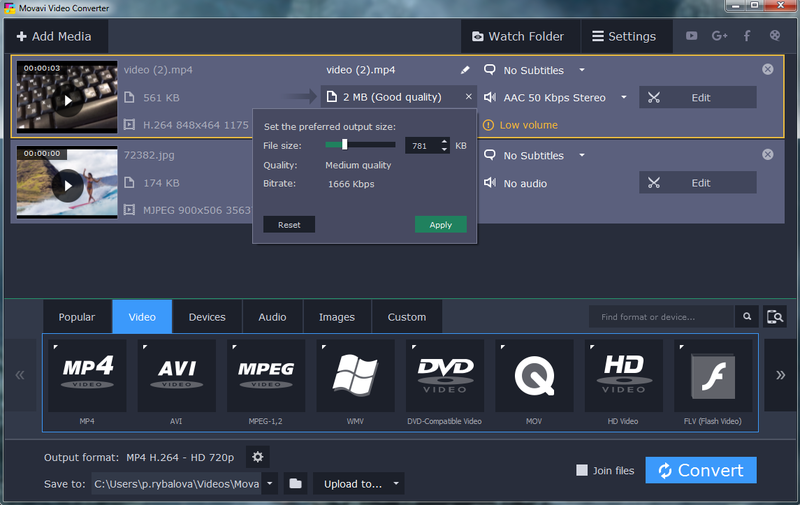 In short Movavi Video Converter will allow you to not only ensure that your videos are compatible with different devices but will let you adjust and optimize its video settings, or compress its file size too. Aside from converting videos, Movavi Video Converter can convert audio and image files too. Due to the fact that it can cross-convert between media files, you will be able to create animated GIFs from video clips, extract audio tracks from videos, or grab screenshots from video frames. The editing tools in Movavi Video Converter are designed to equip you with the basic necessities that you may require. In particular it will let you enhance the quality of videos, fix common issues, trim out unwanted parts or crop and rotate the frame. It is possible to merge video or audio files together as well. As you can see these features are all geared towards providing users with the means to prepare media files for use in various ways – especially those that are in-demand nowadays. By giving you the means to convert, edit, cross-convert and optimize media files, Movavi Video Converter will ensure you don’t need to use several separate tools to prepare them. Regardless of whether you want to be able to make sure that your videos are compatible with different devices, or optimize them for various uses – Movavi Video Converter is more than up to the task. Its rich selection of features will provide you with the versatility that you need to handle media files of any kind. Arguably its greatest strength however is the fact that it is so easy to use, and requires no prior experience of any kind.